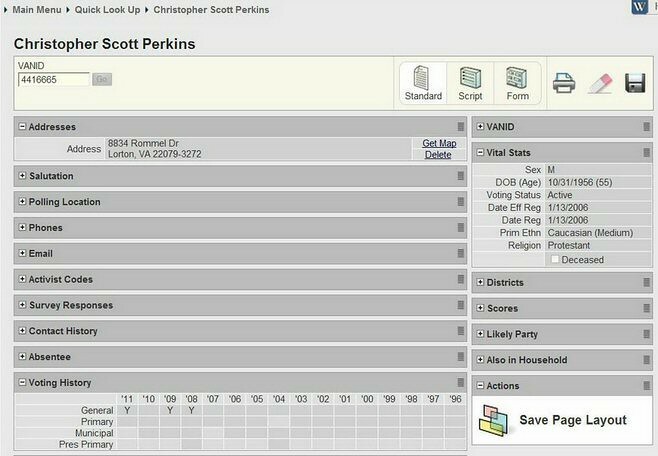 I’m not a Republican, nor do I play one on TV, but if I were a Republican, a few things from 11th CD Republican congressional candidate Chris Perkins voter file (click on image to “embiggen”) would kinda make me go hmmmmm. First off, notice that Perkins says he’s “lived in Fairfax County since 1991,” yet he didn’t vote in any election for at least a decade(1996-2007) of that period? Wonderful. Second, since 2008, when Perkins actually did finally start voting on occasion, he still managed to not vote in any primaries (e.g., Keith Fimian vs. Pat Herrity) or municipal elections (e.g., County Board). P.S. Perkins did find time to support Blue Dog “Democrat” Gene Taylor of Mississippi during the final days of the 2010 campaign, including volunteering on Taylor’s campaign for two weeks! Priorities, priorities. According to the FEC, Taylor then gave Perkins $1,000 on May 13, 2011. As I said earlier — hmmmmm.